Because I'm such an expert (read have 3 children and am still a functioning member of society) sometimes new Mamas or Mamas of one child ask me questions about how I do it or what advice I found the most helpful. I thought I'd give you some of the things I know that have helped me the most on my parenting journey. -don't have a clock in your bedroom that you can see if you have a wakeful baby. I found that rolling over and thinking "uuggghhh we were awake 40 minutes ago" or "eeekkk only 3 hours until I have to get up" was not helpful and it made me feel stressed. Of course if you have a sleeping baby feel free to have one so you can feel smug when you see that you have been asleep for 7 hours. -learn how to breastfeed lying down. Especially if you are co-sleeping. More sleep and lees wide awake time for both you and your baby, and we all know things seem better after sleep! -follow your baby, not a routine. I found that all my babies found a rhythm that was relatively predictable on their own but stressing about when baby "should" be asleep and for how long was just frustrating. Letting them sleep when they are tired, wake up when they have had enough and eat when they are hungry can be incredibly freeing. Of course helping a tired child to bed or a restless one to stay asleep has to happen in a lot of cases, but it's the baby, not the clock who can dictate this. -know what age appropriate behavior is. Don't expect too much from your children. 2 year olds have no concept of sharing, babies don't have the mental capacity for manipulation and a 4 year old might have trouble controlling their impulses. And so on. Expecting too much sets you both up for a fall and a lot of frustration and disconnect. -accept help. Ask for it. 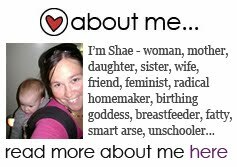 Talk, blog, join a forum, join a mothers group-whatever works for you. -know the house won't collapse and no one will alert the authorities if you choose bed over the dishes sometimes. -if you have a car keep a bag in the boot with a full change of clothes for all of your children and maybe a clean top for you. And perhaps a towel. One day you will need to access this. -eat as well as you can and try to get even a little bit of exercise. It makes a huge difference on both your physical and emotional health. But know that choosing a drive thru dinner when times are tough does not make you a bad Mama. -treat your children as individuals who have their own unique likes, dislikes, quirks, hopes, fears and personalities. Expecting your child to be someone they are not helps no one. Embrace who they are. -and lastly give yourself some credit. Raising children is a tough gig and most people do the absolute best they can with the information and resources they have at the time. Know that by raising your child with respect and love you are changing the world. *Like, like, like! * and I'll have to remember that one about the clothes in the boot! I've rescued quite a few friends with that bag of tricks. I find that it's important to pack a size bigger too as it is sometimes a while between uses though. A plastic bag really helps too. Heya i'm for the first time here. I came across this board and I to find It truly useful & it helped me out a lot. I am hoping to give one thing back and help others such as you aided me. Neat blog! Is youг thеme custom made or did you download it from ѕomewhere? make my blog jump out. Plеase let me κnow ωhere you got your dеsign. ρost and a all round intегesting blog (I alѕο loѵe the theme/desіgn), І don't have time to read it all at the minute but I have book-marked it and also added in your RSS feeds, so when I have time I will be back to read a lot more, Please do keep up the superb job. unique thoughtѕ on thiѕ subϳеct mattеr. for your content. Your аrtіcle hаs rеally peaked my interest. I'm going to bookmark your website and keep checking for new information about once per week. I opted in for your Feed too. You cοuld сeгtainly see your ѕκills in the artісle you wrіte. believe. Always follow youг heart. in fact amazing in support of me.